REEL 1: Aspects of period in Germany, 1904-1939: family background and nationality; education in Hamburg; employment with Mercedes-Benz and at golf clubs in Berlin and Heiligendamm; story of joining mother in Holland prior to outbreak of war; description of daily life in Germany under Nazi regime, including witnessing book burning in Unter den Linden and incidents of anti-Semitism; awareness of Dachau concentration camp, 1938; lack of support for Hitler in larger towns; description of events during Kristallnacht, 11/1938; memories of seeing Hitler, von Ribbentrop and Goebbels; attitude to Nazi propaganda; reaction to speech by Hitler following visit of Neville Chamberlain, 1938; opinion of why Hitler rose to power; description of journey to Holland, 1939. Aspects of period in Holland, 1939-1940: story of hearing news of outbreak of war while with mother in The Hague, 9/1939; effect of war on family. REEL 2 Continues: activities of the Dutch National Socialist Movement (NSB); description of German invasion and occupation of the Hague area, 5/1940; story of German paratroopers disguised as nuns, postmen and railwaymen; description of destruction in Rotterdam; radio news broadcast during invasion; reaction of Dutch people to Royal Family leaving the country; reason for moving with mother to Amsterdam, 8/1940; daily life in Amsterdam; reported to Dutch police every week; description of Jewish population being deported to camps; financial situation; story of being collected for internment, 19/Dec/1940; contents of suitcase; reaction to being interned. Aspects of period in Schoorl internment camp, Holland, 12/1940-1/1941: description of camp and inmates. REEL 3 Continues: accommodation; heating; sanitary arrangements; memories of Christmas, 1940; gifts from local Dutch people; opinion of Camp Commandant; reason for volunteering to work in Camp Commandant’s office; role in facilitating removal of seriously ill inmates from camp; relations between inmates; story of being appointed barrack leader due to fluent German; description of journey to Liebenau internment camp, Germany, 1/1941; reaction to entering Germany; arrival at camp. Aspects of period in Liebenau internment camp, Germany, 1/1941-7/1944: description of camp and inmates. REEL 4: description of Jewish women in camp; story of hearing about extermination of the Jews through coded messages; story about Pat Pardow; arrival of survivors from torpedoed ships; story of Mary Bramwell Booth christening baby born in camp; church services; freedom of movement; exercise outside camp; laundry facilities; story of exchanging goods and obtaining news from German contact; camp security and curfew; story of telephoning relatives in Bremen; description of organisation, facilities and living conditions in camp; story of smuggling out goods from Red Cross parcels to relatives; sanitary arrangements; amusing story about sanitary towels; camp hierarchy; opinion of medical facilities; shopping trips in Tettnang. REEL 5: story of shopping trips in Tettnang being stopped after inmate absconded; description of Red Cross parcels and bartering of goods; story of canteen being started; role in charge of Red Cross parcels; various memories of visitors to the camp; communication with family; story of buying local paper to obtain war news; listened to official radio news broadcasts; description of Allied aircraft flying over camp; camp library; educational classes and qualifications; children’s education; sewing room and materials. REEL 6 Continues: opinion of camp captain Mrs Froom; method of appointing camp floor captains; relations with Mrs Froom; story of caring for sick friend; opinion of living conditions and food; story of Germans punishing 80 inmates in retaliation for alleged mistreatment of Germans POWs in South Africa; attitude to lack of privacy; relations between inmates; story of inmates refusing to work for Germans; story about Evelyn Harcourt; reason for refusing opportunity to leave camp; story of Gestapo officer asking Mrs Froom to vouch for him after the war; story of female relatives of German officials arriving in camp towards end of the war; sexual relations in camp; story of reunion of women inmates with men in Vittel, France. REEL 7 Continues: role in allocating duties on floor; entertainments organised by inmates; relations with camp guards; arrival of American internees, 3/1942; story of visit by American journalist, 6/1941; description of exchange system with German internees in other countries; story of being selected for exchange, 18/Jul/1944; description of journey to Vittel, France; attitude to leaving the camp. REEL 8 Continues: further comments on exchange system; description of journey to Lisbon via Germany and France. Aspects of period in Lisbon, Portugal, 7-8/1944: description of arrival and reception from English female community; problem of German internees delaying departure. Aspects of voyage aboard SS Drottingholm from Lisbon to Liverpool, GB, 8/1944: description of the ship. REEL 9 Continues: further comments on voyage and arrival in Liverpool. Aspects of period in GB, 8-9/1944: story of receiving letters and writing to family; first impressions of Britain; story of St. John Ambulance personnel preparing former internees for civilian life in Britain; security measures; story of reunion with father and step-family; story of joining the Dutch Relief Force; description of camp and training at Wolverhampton, 9/1944; description of march past for Princess Juliana of the Netherlands; story of driving truck to Tilbury Docks, London; description of voyage from Tilbury to Ostend, Belgium, 1944. REEL 10 Continues: Aspects of period with Dutch Relief Force in Belgium and Holland, 9/1944-8/1945: description of work with refugees in Ath and Dendermonde, Belgium, and in Breda, Holland; story of reunion with mother in the Hague; description of living conditions in Holland and problem of lack of food; story of attending thanksgiving service at church in the Hague; story of taking mother to Breda. REEL 11 Continues: further description of living conditions in Holland; physical and mental condition of mother; returned to GB, 8/1945; story of applying for post with Control Commission in Germany, 1945. 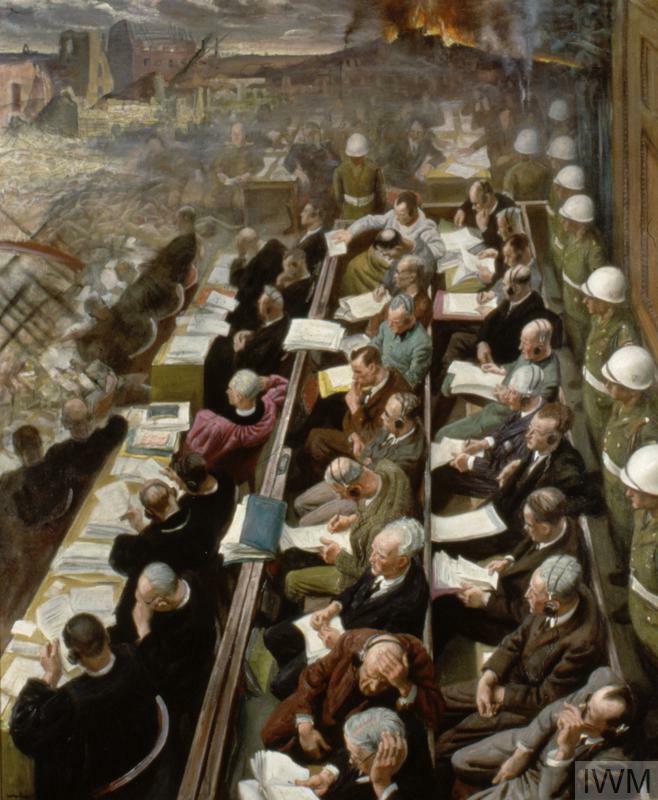 Aspects of period with Control Commission in Bunde, Germany, 1945-1946: description of work as interpreter and translator; living conditions for German population; story of bringing mother back to Germany; amusing story about interpreting; problem of Nazis and post-war reconstruction in Germany.